Unique Spanish Peaks International Celtic Fest Set for September Hooley. Over the centuries, the famous Spanish Peaks in Huerfano County, Colorado, have been welcome landmarks to Native American tribes, explorers, immigrants traveling the Santa Fe Trail. Over the last week of September, the peaks, also known as Huajatolla (pronounced Wa-ha-toy-a, Ute translates as “Breasts of the Earth”) will be the beacon guiding Celtic music lovers to one of the most unique events of its kind, the Spanish Peaks International Celtic Music Festival. “Spanish Peaks,” as the Fest is referred to by many, is a retreat as much as it is a festival. Folks come from near and far to learn and celebrate the living traditions of Celtic music, dance, singing and storytelling. Some come from great distances to take part in the festival and also explore some of beauty and history of Huerfano County. The festival is designed for all levels of interest and all budgets. You will find the casually interested taking advantage of free entry level workshops to seasoned professionals who want to learn a new tune or nuance, and network and play in sessions with other world class players. “Spanish Peaks” is unique in a number of ways. You won’t find the tell-tale field full of tents that defines most festivals. The event, September 27-30, is an Huerfano county wide festival that includes the four major areas of population, Cuchara, La Veta, Walsenburg, and Gardener. The artisan town of La Veta is the center of the festival workshops and houses the fest’s office and store. 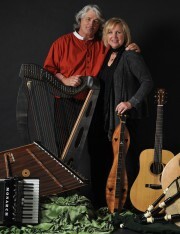 Concerts and other activities are held throughout the 4 towns, and the annual Harp Retreat will again be held in Walsenburg. Walsenburg will also be the site of a new offering this year, a free early evening street concert and dance hosted by Willson and McKee. It will end in time for you to enjoy dinner and get over to the much anticipated Martin Hayes and Dennis Cahill (and friends) concert at the Fox Theater a couple blocks away. FullSet (and friends), a young award winning band from Ireland making their first Colorado visit will headline at the Fox Theater on Saturday night. One of the most unusual events offered at “Spanish Peaks” is the free Friday noon Ceili/Ceilidh (Kay-Lee, both spellings)/picnic at the awesome “UPTop” Ghost Town off old La Veta Pass. This relatively new event is becoming an increasingly popular event for locals and out-of-towners alike as they play, sing, and dance at the old abandon saloon. By popular demand there will be more dancing this year as Irish Set dancing (all ages/partner dancing) is introduced to the fest by multi-talented Mairtin de Cogain, who besides singing and telling stories, teaches and calls the exciting dance form. Players who want to learn “The Lift” to play for dancers will have the opportunity to take workshops to learn and hone their skills. The night owls will enjoy post night concert music sessions, and new night storytelling and set dancing. and have reached out to many underserved schools and educational programs in 10 States. Last year alone they spent 325 days on the road, reaching over 15,000 students. Over the years they have also produced concert series, festivals, workshops, and arts conferences. The internet makes it possible for any band anywhere to be heard around the world at virtually any time. There is an old-fashioned comfort that can be found in the immediacy and intimacy of radio broadcasts that may be preserved and listened to again but can only be heard live once. Boulder station KBCO and its Studio C shows come most readily to mind for that kind of magic – you can hear it live if you live in radio range or on the net if you tune in. Rarely, however, does a local band get a chance to be heard in another country! In July, several local bands were given an opportunity to be heard on Scottish radio by Madelaine Cave (www.madelainecave.com), a former resident of Boulder and Broomfield who now lives in Haddington, a town about 20 miles east of Edinburgh. Madelaine has her own weekly show “East Coast Folk” on community radio station East Coast FM (www.ecfm.co.uk). On a visit to Colorado, she recorded several of her shows in the Longmont studio of Craig Corona to which she invited local bands and musicians. Included among them were Colcannon, Deb and the Pariahs, The Celtic Friends, Loretta Thompson, Craig Corona and Crowboy, an Americana/Folk Rock/Indie band. Born in the East Lothian coastal town of North Berwick to a family where her mother sang, brother played guitar and stepfather the fiddle, she arrived in Colorado via her first marriage to a diplomat who was the American Consul General to Scotland. When that marriage ended, she chose to remain in Boulder with her daughter and continued her life-long love of singing. 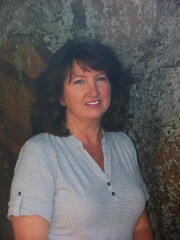 Madelaine re-married in 2000 and began sitting in on sessions around town, taking bodhrán lessons from Bonnie Carroll, vocal coaching with Karen Tucker Patterson and Liz Whitney, and performing with High Country Chorus in Wheat Ridge. In 2010 Madelaine began working with Mark Geissler, Craig Corona and Chris Smith and released her first CD of Scottish songs entitled “Away To The Westward”. A copy of her CD found its way to East Coast FM radio, and while on holiday in Scotland Madelaine was invited as a guest on the morning show by presenter Jim Anderson. When program director Ian Robertson learned that Madelaine was considering a return to Scotland on a more or less full time basis, he offered her a show of her own and in the course of less than a year she grew the station’s folk music library from just a few albums to hundreds. On her weekly show (8 PM to 10 PM GMT each Tuesday), she includes tracks from both well-established and up and coming folk musicians and often has guest artists who perform live in the studio. On August 28th “East Coast Folk” with guests Kathy Stewart and Patsy Seddon featured the songs Davy Steele, the Scottish singer/songwriter who died in 2001. Davy’s widow, harpist and singer Patsy Seddon, brought together many of Davy’s friends to perform songs from the CD “Steele The Show” at the Trad on the Tyne Festival in Haddington. Madelaine had recorded some of these songs being performed by Colorado musicians and played them on that show to the delight of Patsy and Kathy. Nessie, the friendly giant mascot of the Colorado Scottish Festival, will be dancing up a storm Saturday night, August 4, when Irish balladeer and humorist, Seamus Kennedy, and the Indi/Scottish/Folk rock group Enter the Haggis take the Festival stage in a musical extravaganza. The internationally known musical acts will follow the5 p.m. Hot! Piping and Hot! Drumming contests, judged by the audience. Now in its 49th year, the all-new Colorado Scottish Festival and Rocky Mountain Highland Games runs all day August 4-5, 2012, in Highlands Heritage Park, two miles south of C-470 on Quebec in Highlands Ranch. With its new Title Sponsor, the Streets of Southglenn, the Colorado Scottish Festival is open from 9 am to 10 pm on Saturday and from 9 am to 5 pm on Sunday. Tickets can be purchased in advance from the website, or at the door. Special rate for seniors; children 6 and under are free. Free parking and shuttle service. 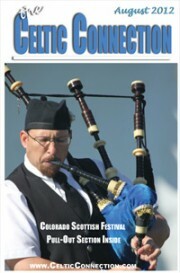 For tickets and additional information, visit www.scottishgames.org, or call the Festival’s hotline at 303-238-6524. O’Neill attended Fairview High School in Boulder and was named Colorado’s 2011 Gatorade Boys Soccer Player of the Year, as well as earning MVP honors in the 2011 High School All-American Soccer Game. He was also a standout basketball player at Fairview, earning BoCoPreps.com Player of the Year honors this past winter. At 6’2”, 190 pounds, O’Neill has played as both a midfielder and a forward in soccer, and his 10 goals for the Rapids U-18’s this season led the team. He has been training with the Rapids first team throughout 2012, and has played in four Reserve Team matches this season, including playing the full 90 minutes in a 3-1 win over Sporting Kansas City on June 9. He had planned on playing soccer at the University of Virginia this fall, but instead will stay in Colorado and is available for selection with the first team immediately. O’Neill is the second Homegrown Player – a roster designation that allows MLS clubs to sign players from their youth system to contracts that do not count against the salary cap – to be signed by the Rapids, following Davy Armstrong of Aurora, who joined Colorado’s first team on August 16, 2010. Born in Midleton, Ireland, Shane moved with his family to the United States when he was one year old, and he has dual citizenship in the United States and Ireland. His father Colm O’Neill, won All Ireland medals with County Cork in Irish Football, and is in the restaurant business, including ownership of Conor O’Neill’s in Boulder. Both father and son played on championship GAA teams with the Denver Gaels.